Tumblr, the insanely simple blogging system that has been praised for its clean design, only rarely adds new features. This is generally the right strategy, because most blogging systems are far too complex, and Tumblr’s spartan feature set really sets it apart from competitors like WordPress and TypePad. But this week the company added one smart new feature that, while slightly increasing Tumblr’s complexity, will make it much more useful for people who already have an existing blog (and want to move it to Tumblr), or for companies and individuals that want to build an entire Web site based on the Tumblr platform. 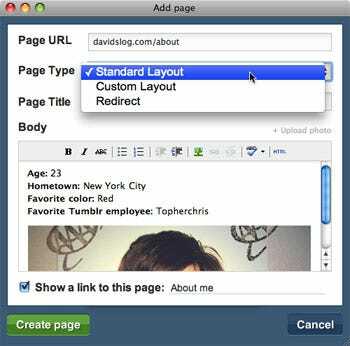 The new feature is the ability to make “pages” as part of your Tumblr site. Pages are designed to be used for things like an “About” or “Contact” page, or anything else that you don’t want to be considered a time-based, newsy “post.” Unlike posts, Pages won’t go in the reverse-chronological flow of a site’s river, and won’t feed out over RSS. Allows companies to have a slightly more elaborate site, completely powered by Tumblr, that includes an “About” or “Contact” or “Advertise” page. Can be used to create old URLs from your previous site, either as pages on your new site, or as auto-redirects to another domain (such as oldblog.mydomain.com). This would be cumbersome to set up if it’s more than a few dozen URLs, but Tumblr could eventually automate this somehow. What’s the point? This gives Tumblr yet another leg up on WordPress and TypePad — in addition to its simplicity and rich community, the main reasons for using Tumblr — for people and companies who want very simple blog tools. We’d note that Twitter already uses Tumblr for one of its two blogs, and AT&T’s new blog to promote its first Android phone is based on Tumblr. Tumblr is still far behind the WordPress and TypePad domains in traffic, but it’s steadily building. This obviously doesn’t take blogs into account that use separate domain names, but it should be directionally accurate.